Close up of wax moth larvae on brood comb with webbing and damage from tunneling. Adult moths lay eggs but the larvae do the damage. Wax Moths In Bee Hives – Why Are Larva a Problem? Have you inspected your weak bee hive only to find a webby, wormy mess? What on earth is going on inside your hive? Has a family of spiders moved in? No, I dont think you have spiders – you have wax moths. Finding wax moths in beehives can be very upsetting. And, wax moth larvae in bee hives is a horrifying experience for new beekeepers. Seriously, it’s not a good experience for us experienced beekeepers either! So, why did this happen to your hive? Have these bugs taken over your hive? Yes and no. First, we need to understand the nature of the wax moth. Many beekeepers put out “moth traps” to try to lessen the number of adult moths entering beehives. These traps are commonly home-made with many different “bait” recipes in use. 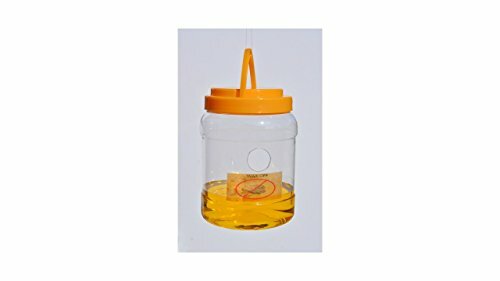 I was interested to find a wax moth trap available for purchase. This would be one option to try without having to construct a trap. Perhaps you can experiment with bait recipes. But don’t expect traps to the the complete answer to wax moth problems. What Is A Wax Moth? What are wax moths? Actually, there are 2 types of wax moths that trouble beekeepers. Galleria mellonella, the Greater Wax Moth and Achroia grisella, the lesser wax moth can infest beehives. The moths (attracted by hive odors) enter a bee hive during night. We blame the flying moths but they are not the main culprit. The adult moths themselves, do no damage to the hive. But if the population of bees is not large enough to guard all of the comb, the adult moths lay eggs on the comb. These eggs can hatch in 3 days during warm conditions. These wax moth larvae are the true culprit. When the moth larvae hatch, they begin to feed. It is the larvae of wax moths in bee hives that cause all the damage. What Do Wax Moths Eat? In the beginning, wax moth larvae create tunnels with webbing. Wax moths prefer comb that has been used by the bees. The wax moth larvae eat beeswax, the remains of bee larval cocoons, bee cocoon silk and bee feces in the cell. Bee cocoons are the materials left behind by a developing honey bee. Any comb that has had bee brood, will be more attractive to wax moths. Older larvae turn grey and can measure up to 28 mm in length. They are very mobile and can move from one hive to another – although this doesn’t happen often. When the wax moth larvae have ended the feeding stage, they will form cocoons and transform into adults. They will often eat away wooden surfaces in the hive creating a wavy surface and causing damage. The larval stage can be completed in 19 days from hatch in warm weather. Beekeepers who use plastic foundation have less of a clean up job on wax moth infected frames. But those of us who prefer beeswax foundation need to keep extras on hand.The cocoon stage lasts about 14 days before adult moths emerge and begin the life cycle again. Do Wax Moths Kill Bee Hives? It is a common occurrence for a beekeeping student to tell me “My hive was killed by wax moths”. This is upsetting for any beekeeper and especially for those new to the hobby. However,wax moths don’t normally cause bee colonies to fail. They are just a symptom of another problem the colony has. In reality, wax moths seldom kill a hive of honey bees. Finding wax moths in bee hives is an indicator of something else. I always tell my students in my beekeeping classes that Wax Moths are a symptom not the problem. A strong colony of honey bees will keep wax moth infestations under control. So why are you having a moth problem? Do you have a lot of bees in the hive? Are there enough bees to cover most of the comb surface? They must have a large enough population to prevent adult moths from laying eggs.. It is the weak hives that are the biggest target. If your hive is weak, you must try to learn why. Perhaps, something has happened to your queen. You didnt squish her did you? Or, maybe she died or is failing. A queen failure or any condition that allows the bee population to drop is a problem. Another problem is when a beekeeper puts too many boxes on a small, struggling colony of bees. How Do You Know If You Have a Wax Moth Infestation? How does a beekeeper know if they have a problem with wax moths in bee hives?Seeing an adult wax moth fly out is not a cause for concern. But, you may see larvae and that is a reason to investigate further. The defining characteristics of wax moths in beehives is the presence of webbing. 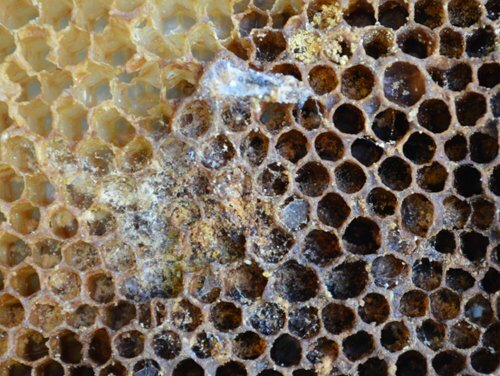 Wax moth larvae tunnel through the honeycomb. They leave behind noticeable tunnels with a “spider-like” webbing. This process continues until all the wax has been consumed. Leaving a webby, mess for the beekeeper to clean. Their feces (small cylindrical black pieces) can also be seen on the bottom board. Wax moth larvae destroy comb and leave behind webbing and frass. The best defense against wax moths is to maintain strong colonies. A healthy, strong colony will repel any attack and keep the bee hive relatively moth free. Don’t give your honey bees more space than they can patrol. Too much space, too few bees – big trouble. Take beekeeping boxes off the colony when not needed. Leaving too many honey supers on the bee colony in late summer is tricky. If your bee population declines too quickly, you could end up with hive beetles and wax moths in the bee hives. Monitor the population of your colonies. Did one swarm? If the population has dropped dramatically, you have comb that can not be patrolled. Check the colony to ensure that the population of bees matches the space inside the hive. One of the biggest mistakes made by new beekeepers is improper storage of honey supers. Adult Wax Moths are attracted to beeswax. While they prefer comb with pollen or that which has held brood, they will consume your drawn comb. Especially, if a little bit of brood rearing has gone on in it! Drawn comb is an expensive resource for beekeepers. We want to protect the honeycomb that our bees have worked so hard to make. Starting your colony off with drawn out comb instead of foundation can result in a larger harvest next years. Freeze any combs for 2-3 days, then place them in an airtight storage bin or plastic bag. You must freeze them first! Freezing kills any moth eggs that you cannot see. After freezing, placing them in a tight storage container. The other option is to stack your honey supers in a light airy place. If you live in a region that has cold winters, this will help you. Stack the supers in a crisscross fashion that allows light and air to reach the honeycomb. (I knew one older farmer who would hang his empty supers from rafters in the barn during winter). Adult moths are attracted to darkness and deterred by light. If you fail to store your supers of drawn comb properly, you may find a nasty surprise in the Spring. In darkness, wax moth larva hatch and feed. When they reach the end of the larval stage they form cocoons. 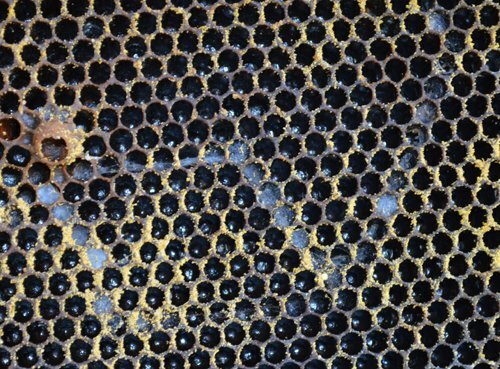 The form of BT known as bacillus thuringiensis is used by some beekeepers to protect comb frames. 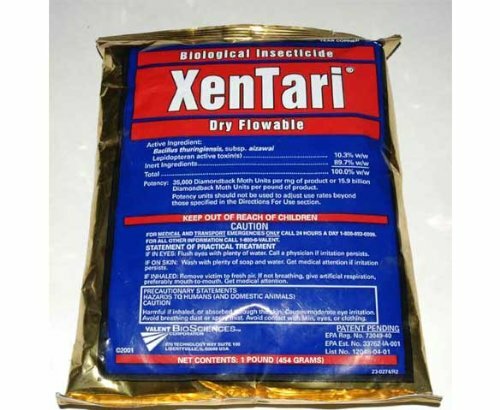 It was previously sold under the product label – Certan or Xentari. It was labeled for use in bees and helped control wax moths in beehives and stored comb. This dry product is mixed with water and sprayed on new foundation or honeycomb. This would be done before placing boxes on the hive or after removing them. BT kills wax moth larvae. Studies showed no negative effects on the honey bee colony. When the label registration for Certan ran out, there was not enough money involved to encourage renewal. PDB (Para Dicholorobenzene) is a chemical compound in a crystal form labeled for bees and approved by the FDA. The pack of crystals is placed near stored honey supers to control wax moths. This chemical is also a known carcinogen. I have never used it. While they may cause many headaches for beekeepers, wax moths are not an enemy of honey bees. They are a natural part of the bee ecosystem. In the wild, wax moths enter an abandoned colony and clean up old comb. This leave a clean disease-free cavity for the next bee swarm. Some people actually raise and sell wax worms as fishing bait ! Understand the ways of the wax moths. Use honey bee management practices to deter wax moth infestations in your colonies. Proper storage techniques can protect your stored supers. If you live in a region with cold winters, you will only have to worry about wax moths in beehives during the warm season. Our beekeeping friends in warm climates must be vigilant year-round. Thanks for your blogs. Wondered if you can tell me if worker bees normally throw out the drones every few weeks during the season? I observed smaller bees stinging bigger bees outside one of my hives yesterday. Figured they were kicking out drones. The bees have been acting weird lately. Not out foraging like usual. We’ve had weird wet & cold weather for two weekends in a row. What do you think? With the weird weather we have had this year I’m not sure what normal is ! LOL. Seriously, the bees only throw out drones in 2 situations that I know of. One of course is in the Fall. October for me here in SC. They dont need them over winter and dont want to feed them. And the other situation is when resources are scarce. For instance, if I have really hot summer weather with drought – some of my colonies will cast out the drones to save on food. If they need some, they just make some more. No way to know whats happening inside the hive without doing an inspection. Watch out for robbing! That could be what you are seeing. I have a good post on honey bee robbing behavior. First, you must be sure to get the queen bee and she must be well mated. After that, pest management such as developing a mite treatment plant is vital. I have had bees in a chimney for 3 years now. They have rendered the room practically unusable and I could see no way of moving them. Then lately I have had an infestation of wax moth and the bees seems to have disappeared. I do need to clear the chimney of bees and the moths seems to be doing that but how can I make sure that another swarm do not arrive? I will have the chimney blocked up but there always has to be ventilation so bees will get in again. Is there something I can use to get rid of the smell so they do not return? Should I now have the chimney swept and then light a smokey fire or is that dangerous. I would definitely have the chimney cleaned. Yes, hopefully the cleaning process and some smoke will discourage future swarms. My weak hive was infested with wax moths. I am a new beekeeper. Can I just scrape the infested wax off of the frame plastic foundation? Absolutely. That is one advantage to plastic foundation, you dont have to put new wax in the frames. We have the same problem but with wood frames what should we do different? I use wood frames as well. If the comb is not destroyed, just freeze the whole frame and all for a few days and scrape off any cocoons etc that you might see. Then they are fine to re-use. If the comb is over 50% destroyed (on 20% for me), I just replace it with new foundation and use the wax for other purposes. I have holes in my wood frames where the larvae dug in. Do I need to fill them? If so, what should I fill them with? No Missey, I never bother as long as the frames are still strong enough. 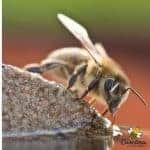 I am a new bee keeper and I have read a lot of atricals on the day to day challenge of my new hobby. I have to say that your information that you give to your followers is clear and decide. You have a way of getting to the point and being very informative about your skill. I would love to join you blog and get some more ideas and information about this skill you and others have learned. 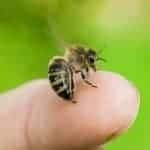 I have invested a lot in my hives and now that fall has come I have realized that it is now getting to the next chapter and will be a totally new learning curve with the different types of pest and the way that they need to be controlled. Thank you for your time and your help and I look forward to your wisdom.